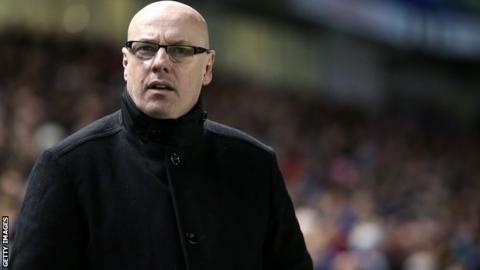 Leeds United boss Brian McDermott has revealed that he has received abusive phone calls from irate supporters. The off-field uncertainty at the club has coincided with poor performances on the pitch and the side have lost six of their last seven matches. Some fans at Tuesday's 1-0 defeat by Charlton called for McDermott to resign. "I got some phone calls late at night recently and it's just not right," he told BBC Radio Leeds. "There's a right and wrong and that is just wrong because I am digging in. "It will change. The situation is temporary and soon we will have some clarity at this football club." The club's planned takeover by Massimo Cellino was blocked by the Football League last month and the Italian is waiting to hear whether his appeal against that decision has been successful. On Wednesday Mike Farnan of the Together Leeds consortium confirmed that his group was in discussions with Cellino about the potential of working together. Last week, Leeds players agreed to defer part of their wages and, having been paid 50%, they received a further 15% on Thursday. A spokesman for Leeds owners GFH told BBC Sport that the funds came from money generated by the club. "The 15% paid to the players today came from club funds on the instruction of managing director David Haigh," he said. Former Reading boss McDermott said the situation at the club had been an eye-opening experience. "You learn a lot about people and you learn a lot about yourself and how to conduct yourself. "It's a situation you shouldn't have to go through and you don't get taught how to got through this on the pro licence." McDermott's side travel to play-off chasing Wigan on Saturday.